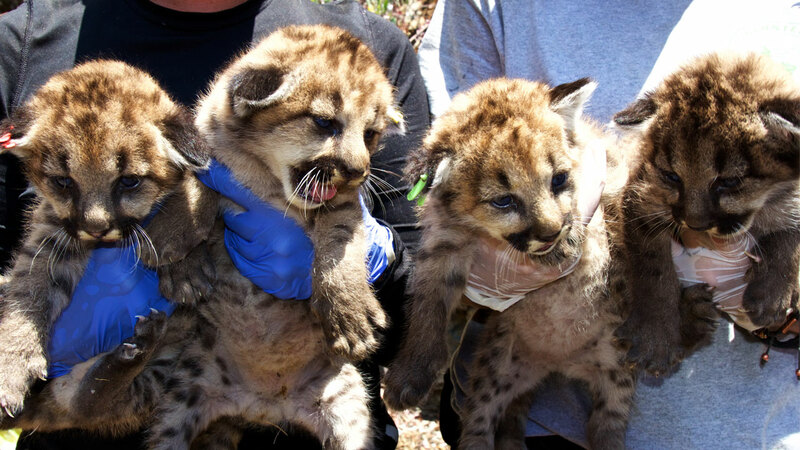 Four mountain lion kittens found in the Santa Monica Mountains are shown in a photo taken by National Park Service researchers. THOUSAND OAKS, Calif. -- National Park Service researchers discovered a litter of four mountain lion kittens, but they are suspected to be products of inbreeding. Two boys and two girls were found in a remote area of the Santa Monica Mountains. They are now P-70, P-71, P-72 and P-73. It is the fourth litter of kittens for mother P-19. Researchers believe she mated with P-56, a 3-year-old male who is also her grandson. P-56 is also a product of inbreeding, as his mother mated with P-12, who is his father and grandfather. Genetic testing is required to confirm the paternity for P-56, but researchers found that two mountain lions spent about 90 days together before the birth of a kitten and that's the gestation period for mountain lions. National Park Service biologists took tissue samples, conducted a general health check and marked the kittens with ear tags. Researchers have studied P-19 since she was four weeks old, and she is now 8 years old. Of the seven kittens from her previous litters, four died, two were never given GPS collars and one is confirmed to be alive. Various entities, including Caltrans, are working on a plan to build a wildlife crossing bridge over the 101 Freeway in the Liberty Canyon area.